[ROM] MIUI 10 Global Beta ROM 9.4.18 for Redmi 6 Released: Download Now! [ROM] MIUI 10 Global Beta ROM 9.4.18 for Redmi 6A Released: Download Now! [Announcement] Rules & Regulations : Please Kindly Read Before Posting! [ROM] Please help with EDL authorization. 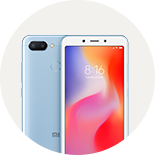 [Q&A] redmi 6 pro to mi a2 lite? [Discussion] Global stable update for note6 pro?